Playing an 18-hole final round at Augusta National reminiscent of Tiger Woods, or slotting the winning goal in the Champions League final à la Lionel Messi is what games consoles are all about. Even for those who participate in regular physical activity they represent some welcome escapism. After all, the roar of the crowd in a virtual Wembley Stadium or in the stands at a computer-generated Grand Prix motor racing venue beats Saturday morning competing in front of one man and his dog in the pouring rain. These games are all about fantasy, but the reality is that they can still cause injury if players do not follow the safety advice offered by manufacturers. This can mean, for example, that playing time should be limited to around half an hour, to give the eyes a much needed rest. The fingers and wrists, too, can take a battering while repetitively punching the buttons to hit a home run or make a goal-line clearance.Shoulders and lower back may well take more than their fair share of strain due to tension building up during game-play and involuntary leaping from the couch at particularly dramatic moments. Not only that: simply trying a little too hard can lead to physical injury. Take as an example golf sims such as those available on Wii. The regular safety hints included in game play concerning the importance of a smooth action are there for a purpose: to stop players risking torn shoulder muscles from gripping and swinging the remote too hard in an effort to make an extra 20 or 30 yards down the fairway. 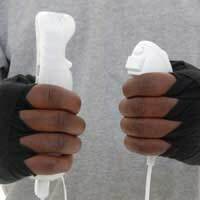 The physicality of the Wii concept can cause other damage as well, if you are not careful. Take those onscreen messages about ensuing the strap of the remote is securely fastened around the wrist - that is because the manufacturer could envisage a remote flying out of a player’s hand in all the excitement of game play and totalling someone’s precious heirloom, a light fitting, or perhaps leaving the family cat nursing a thick ear. To avoid such calamities, ensure any precious items are a safe distance away from the players’ flailing limbs. If there are rugs on the floor, roll them up for the duration as slipping or tripping up may lead to more than the embarrassment of ending up on one’s backside. And don’t forget to not take these games too seriously. Winning should be a pleasant surprise rather than something that must be achieved at all costs, however annoying it is that your partner or sibling seems to win, or in your mind get lucky, every time. Games consoles are great fun and completely harmless provided players follow the safety tips provided by manufacturers. For those who remain dedicated couch potatoes, hopefully the excitement of the action recreated on screen will spur them on to pulling on their training shoes and playing for real outdoors. After all, you can still imagine you are Woods or Messi, even if the venue of a local playing field doesn’t quite live up to standards of its computer-generated counterpart.